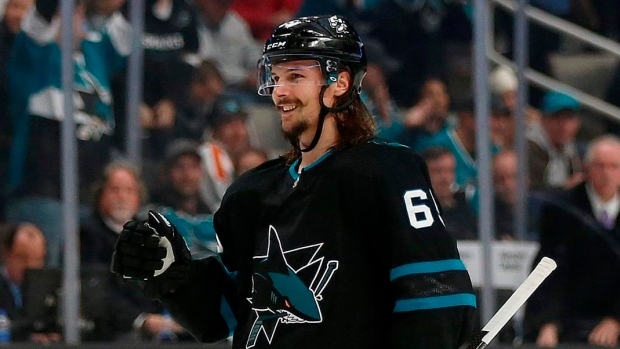 San Jose Sharks defenceman Erik Karlsson vowed again on Tuesday that he will be back in the team's lineup for the playoffs after battling a groin injury. "I said a month ago I was going to be ready for the playoffs and that's still the case," Karlsson told NHL.com. The two-time Norris Trophy winner has missed the Sharks' past 16 games and 10 of their 16 games prior to that with a similar injury. Karlsson, who last played on Feb. 26, skated in practice on Tuesday and added that he would have dressed for the team's 4-2 loss to the Vancouver Canucks if it had been a playoff game. He said he won't be thinking about the injury when he returns to game action. "That's gone with and that's not going to be an issue so for the head space there, it feels good," Karlsson said. "This time of the year I don't think it really matters. I have played through enough to know that as long as it's possible I am going to go and you are going to deal with whatever you have to deal with after the year, and this is the case again. I'm not worried about reinjuring it or getting another injury; that's not the way I approach the game, especially this time of year." In his first season with the Sharks, Karlsson has three goals and 45 points in 52 games. The pending free agent last made the playoffs in the spring of 2017, when he posted 18 points in 19 games as the Ottawa Senators reached Game 7 of the Eastern Conference final. The Sharks visit the Edmonton Oilers Thursday before returning home to conclude their regular season on Saturday against the Colorado Avalanche. "I'd like to (get Karlsson in) but we're not going to do it at the expense of rushing him, so we'll see," Sharks head coach Pete DeBoer said Tuesday. "He'll be ready for the playoffs."